Find out about the potential dangers of jumping into the sea from a cliff, rock or pier. Tombstoning is an activity which has occurred around the coast for generations, unfortunately over recent years it has gained attention for the wrong reasons, with a number of people killed or seriously injured. The title was adopted because of the way a person falls and plunges into deep water, in a similar way a stone would. Water depths alter with the tide - the water may be shallower than it seems. 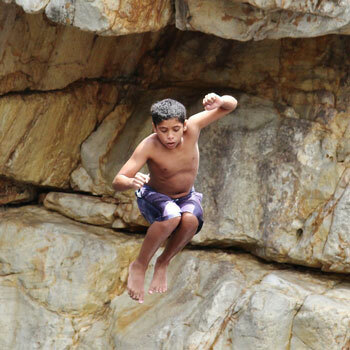 Submerged rocks may not be visible - these can cause serious injuries if you jump onto them. Debris from shipping, fishing vessels and as a result of vandalism could have been swept into or thrown into an area which was previously relatively safe. The shock of cold water can make it difficult to swim. Getting out of the water is often more difficult and dangerous than people realise. Who is harmed and what type of accidents happen? Since 2004 the Coastguard has dealt with over 200 incidents with 70 injuries and 20 deaths. Of those injured the youngest was 12 and the oldest was 45. I want people to look at this picture. This is what can happen if you're one of the unlucky ones. Teens were involved in just over half the cases (55%), followed by those in their 20s (25%) with the remainder of incidents involving people aged 30-40 years-old. Of the non-fatal incidents, spinal and limb injuries (both at 20%) were most commonly reported. Many of the non-fatal incidents have resulted in life-changing injuries and they required significant resources from the rescue services. Young and older fathers were among the fatalities, along with at least three teenagers. Check for hazards in the water. Rocks or other objects may be submerged and difficult to see. Check the depth of the water. Remember tides can rise and fall very quickly. The difference in water depth between the peaks and troughs of waves can be many metres. 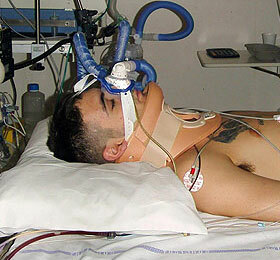 Never jump whilst under the influence of alcohol or drugs. Check for access. It may be impossible or very difficult to get out of the water. Consider the risks to yourself and others. Conditions can change rapidly. Even if you are jumping safely, children may be watching and copy your actions. Think before you jump. Don't let alcohol, drugs or peer pressure affect your judgement. If you jump when you feel unsafe or pressured, you probably won’t enjoy the experience. I got bet 50p and a cigarette that I wouldn't jump in first. The best way to learn about the risks involved and have a good experience is to try coasteering Opens in a new window - a mix of scrambling, climbing, traversing and cliff jumping around the coast with a professional guide.